and in print at -> Artvoice. 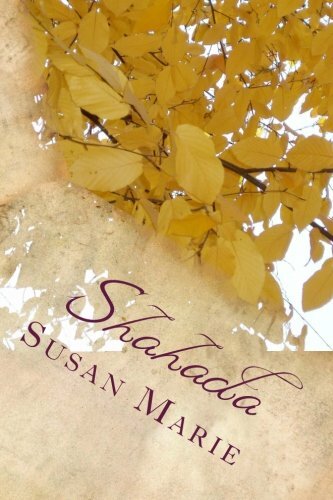 "Shahada is a beautiful book of verse. The author clearly shows us that the role of a poet in society can be multi-faceted. On many pages she is healer: "Let me be the chalk that draws the outline...to your well being." On others, she is the inviting explorer: "Let us upturn rocks and minerals, where salamanders tend to hide..." The honest, discerning way in which this author takes in the natural complex world, decodes it for us, and then places it squarely inside the readers' reach is remarkable. In this increasingly crisis driven world, this is a volume I will turn to again and again for sustenance, a rare gift." "Amidst this World War III based on pure greed and inhumanity one needs real spiritual strength to remain normal and be patient!" Full Professor Emeritus of Mathematics. "A great little collection by a beautiful person pouring her soul into poetry. A beautiful book, truly touching writing. I hope your words inspire many more people." - Tabitha Connelly-George, activist, Mother, awake dear soul. "This short book of Poetry follows in the ecstatic tradition of The Song of Songs (also called The Song of Solomon), combining love, spirituality, mysticism, and Eros in a paean to our shared humanity, creation, and The Creative Force. The Creator, most often feminine in the poems but also masculine or both / neither, sometimes fills the role of the beloved, sometimes the lover. Human love transcends physical existence through its physical connections to the spiritual. The language of the poems sings in a spare register, readable, rhythmic, not obscuring the current of energy of the poems. As with most books I read today, I have some technical quibbles with copy editing and layout, and you might notice a missing apostrophe or typo, but very few and they wouldn’t distract most readers (far fewer than in many big publishing-house books I’ve read). The Poetry keeps you reading, and enjoying, the book. Susan Marie does a good job of imagery, often turning what appears common place into a new observation. Several times I paused and thought, “that’s an excellent observation,” more than once unexpectedly as I didn’t see it coming. In this way and others, the book lives up to its title, which means observation, witnessing, and testifying." Shahada is my 2017 book of poetry, a 71 page volume of pure stream of consciousness derived from years of talking with the world, myself, the human condition, based upon existentialism, raw sexuality, passion, the Divine Feminine and Sacred Masculine, Mother Earth, Father Sky, wind, water, wood, metal and fire.